We are enjoying the sights, sounds and antics of a variety of birds; including their dance of courtship or under the sprinkler or in a puddle! The kingfisher (with a few sparrows) has returned after a gap and sits on a tree in clear view! joys of dancing with friends ! When we had first moved here over 20 years back, there used to be a couple of peacocks strutting around! They soon disappeared, never to return. 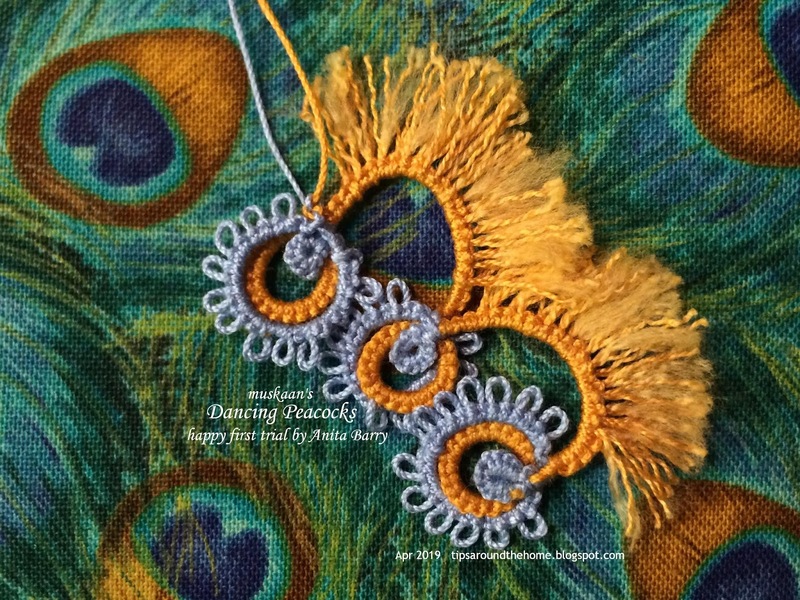 She converted the medallion into a beautiful pendant and also worked out her stitch count for the earrings for a size 8mm bead. The green chain has padded double stitch! This is another pic of her very first try immediately after I uploaded the pattern ('18) – love the vibrant colours & frayed picots!!! While adding her count, I took the opportunity to draw some stepwise diagrams of the floating beads method, as relevant here, as well as generic. With her valuable and in-depth feedback, the notes on page 2 are more streamlined now. At Camp Wanna Tat they have a “Pattern Binder” available for workshop attendees to look through and review. This April my peacocks have been mailed to attendees. And the same pattern will now be taught at Palmettos Tat Days in September this year! Here's a link to the inspiring class pictures. My patterns have made it to the Tat Days goodie bags two years in a row ('16 & '17), thanks to Georgia Seitz's initiative. 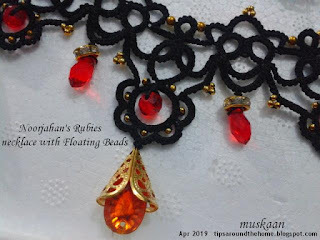 Speaking of, she will be teaching Noorjahan's Rubies - necklace and earrings - at the Shuttlebirds event in May! She is using metallic thread, though I haven't seen it yet. I hope to do the same someday. I have fair reason to dance despite this hot Indian summer, right ?! All these patterns have floating beads methods! I was hoping to create more diagrams for the method and it’s variations, but doubt if it’ll get done by the end of this month. There Has been progress, though. An update to my previous post - 2 new pics have been added - one of mimosa knot leaves, and another prototype of a rose bud. Do check them out. Thanks, Sue :-))) I'd like to remake the set in metallic thread some day. I love the fringe with the top picture :) it sure makes things fun and thank you for the update too! Wonderful news to dance for! Beautiful jewelry! Wow, what feathers in your cap! Wonderful. I'm so excited to be going to Tat Days this year. Unfortunately, I'll be teaching and won't be able to attend the classes Anita and Georgia will be teaching, but I plan to get the CD. You'll answer questions later, right?